Here I have a just over 1,5cm wide bracelet that together with yesterdays bracelet really shows the versatility of a normal three strand braid. In the middle braid I've folded the edges over instead of just straitening them, which gives this interesting look. It's set on white lambskin and has a traditional reindeer antler button. 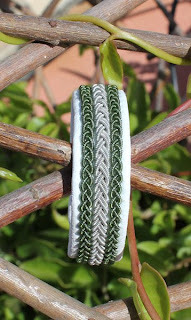 Sadly the sun washed out the color of the pewter thread a little, it's a rich military green.